Mary Cassatt was born on May 22, 1844 in Allegheeny City, Pennsylvania. She was the fourth of five children born to Katherine Kelso Johnston and Robert Simpson Cassat who was a stockbroker and land speculator. During Mary's childhood, her family moved to Lancaster, Pennsylvania, and then to the Philadelphia area. Her family viewed travel as an important part of her education. During the next 5 years she visited many of Europe's capitol cities, learned German and French, and received instruction in drawing and music. Mary's first introduction to the great artists of France most likely occurred at the Paris World's Fair of 1855. Two of these artists, Degas and Pissarro, would later be her teachers. At the age of 15 Mary enrolled in the Pennsylvania Academy of the Fine Arts. Because no degree was offered, Mary decided to end her studies at the academy in 1866 and move to Paris. As women were not yet able to enroll in the École des Beaux-Arts, she asked to study privately with teachers from the school. She also made daily trips to the Louvre to copy art of the old masters. In 1868, her A Mandoline Player, was accepted for showing at the Paris Salon. It was her first painting to be accepted. However, the art scene in France was changing with artists leaving the academy style and seeking a new way of painting. For Cassatt, who continued to work in the traditional style of the academy, it would mean a growing difficulty in getting works accepted. 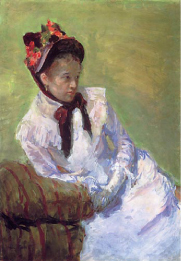 In 1877 Cassatt was invited by Edgar Degas to show her artwork with the Impressionists. She admired Degas' and accepted his invitation with excitement. Her artistic style adopted a new spontaneity. Although she had been a studio painter to this point, she began to carry a sketchbook with her to record the things she saw. In 1866 Cassatt's style changed again. She moved away from Impressionism to a simpler style of painting. She also began to exhibit her works in New York galleries. 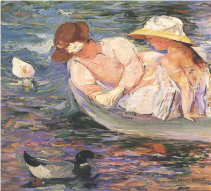 By the 1890s Cassatt's artistic career was at its busiest and most creative time. She also became a role model to young American artists. Mary Cassatt died on June 14, 1926 at Château de Beaufresne, near Paris. She is remembered as a painter of scenes that reflected the intimate relationships of mothers and children. Her most successful works include, The Boating Party (1893-94), Summertime (c. 1894), and Little Girl in a Blue Armchair (1878). In 1904 she was awarded the Lègion d'honneur for her contributions to the arts. 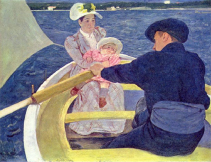 Cassatt may have found insipration for this work in Manet's Boating (1874), a painting that she admired very much.